It was slow to grab my attention but by the end I was hooked. I am curious to see how the rest of the series spins off now. Loved it. Would make a nice tv movie. And I can't wait until the next book comes. This trilogy is an excellent read! Nora Roberts at her best. This was a wonderful story to listen to. I can't wait to listen to the next in the series. This book was an intriguing mix of romance and spirits, and a view into an industry I know nothing about. It was a light read and I liked the characters and story. It kept me entertained and that is a lot of what I listen for especially when making a long drive. 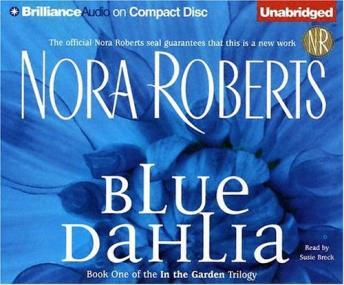 This is the first of one and a half books of Nora Roberts to which I have listened . She is not an author I will listen to again as I do not enjoy banal romance generally and the 'ghost story element' was, for me, just that - an element woven into the text with little significance to the whole. Nora Roberts has come through on another great story. And even though the audio version is abridged, none of the story was lost. the narrator did a terrific job with so many voices, and carried the story well. I laughed, wept (try THAT with fresh makeup on your way to work -- and it was worth it!) and loved the characters. I couldn't wait to go to work in the morning to hear more of the story! This is a good choice for listening enjoyment if you're a romance story lover or Nora Roberts fan! If you're not -- try it, you'll like it! I find all the books by nora roberts in this series wonderful. I usually can't wait to find out what is coming next. Very good book. Another great one for Nora Roberts.She is an aouthor that you have to listen to. Absolutely loved this book. You can put yourself right into her shoes. Best of the three part triology. Fresh and exciting to listen to. Who could help but think (dream) of Logan !! !